We're not any closer to solving the mystery of the Newfoundland UFOs yet, although everyone seems to have their own theory. One astronomer has suggested to me that the photos must show a French missile gone astray, since we know the French did launch several that same day, although at a different time and thousands of miles away in the wrong direction to the Earth's rotation. Hey, if it works for you, fine. The trouble is, we're not getting any bones from the government or National Defence, either. First, the RCMP tells the witness it's a missile launched from St-Pierre-et-Miquelon, then they say it's not a missile from there, but it is "something." That by itself has fueled suspicion that something funny is going on. The government seems to know what it was, but isn't saying. There was even a flippant remark that the UFOs must have been some model rockets shot off by Newfoundland amateur rocketeers, but that particular group denied it when contacted. Besides, the photos don't look anything like model rockets. The proliferation of explanations range from the silly to the sublime. Newfoundlanders just want to know what the objects were. None of the witnesses ever talked about aliens, but politicians and many armchair debunkers have enjoyed pointing fingers and laughing about little green men and UFO landing pads. I had originally suggested the objects were either missiles or high-flying planes catching the rays of the setting sun. I get lots of photos like that every year and the Newfie shots bear a resemblance to these. However, as I understand it, there were no aircraft in the vicinity at the time. Of course, there could have been military air exercises at the time, and we wouldn't necessarily have access to those details. We had a brief bit of excitement Friday night when there was a report on CBC Halifax that some people had reported a UFO streaking over the city at about 5:03 pm AST. It turns out a woman was doing some sledding with her kids near Inglis School by St. Mary's University, and saw a multicoloured object shoot overhead, heading eastward towards the ocean. Other reports were called in, including one from a man near Cow Bay who saw a coloured "paintbrush" soaring overhead. In all cases, the object was only in sight for a few seconds, and suggests the obvious explanation of bolide or fireball. I created a Facebook group: "Did You See the UFOs Over Newfoundland?" but it hasn't attracted any takers so far. We need more witnesses, though. As I noted in a previous post, I have descriptions of the UFOs from other locations besides Harbour Mille, including Buchans, Doe Hills, and Marysville in Newfoundland, as well as a spurious report from New Brunswick. And oh yes, there is a 63-year-old precedent to these recent photos of missile-like UFOs over Newfoundland. In 1947, an odd flying object was seen flying over Harmon Field, near Stephenville, Newfoundland, an American air base. The object left an odd smoke trail which was photographed. Here's the link to the photos and to a NICAP report on the case. The photos are some of the first of the "Flying Saucer Era." The investigations of the Newfoundland UFO reports continue. CTV just updated its news story about the Newfoundland UFO. Apparently, the RCMP have retracted their claim that it might have been a missile from France. In the meantime, I have collected four more eye-witness reports, from various areas, including: Marystown, Buchans and the Doe Hills in Newfoundland, and one spurious report from Fredericton, in New Brunswick! I just spoke with one of the primary witnesses. She said the object looked like a "silver bullet" moving slowly in the sky, about 20 or 30 degrees above the horizon. Her friend saw it first and watched it for a total of 10 minutes. The person I spoke with saw it for about 7 minutes in total, with a short break in the middle when she went to get her binoculars. This all happened, starting at about 5 pm, local time, which is 1 1/2 hours later than Eastern. The witness said she could clearly see black smoke and flames shooting out behind the object, which was in the west, moving eastward. And further, it turns out there were three objects in the sky at the same time. One was going straight up, while two were going east. But the strangest thing is that she claims the RCMP told her the objects were "missiles from St. Pierre-et-Miquelon." Did I miss something? Did France declare war on Canada and I missed it somehow? Darn those Newfies! Another UFO has been sighted and photographed over the Rock. This one was seen Monday night, January 25, 2010, by several residents of Harbour Mille, on Newfoundland's southern coast. Witnesses said the missile-shaped object "flying overhead." There weren't enough details in the news report to allow me to get a clear idea of what was seen, however. We'll have to wait until I get further details or hear from witnesses. In Billy Cox's recent blog about UFOs, he reported on some statistical crunching of UFO sightings reported to MUFON during the past ten years. Those kinds of numbers intrigue Kristen Winslett of Hackettstown, N.J. In fact, Winslett likes to crunch all sorts of numbers. She’s a financial analyst who, in her spare time, does field research with the Mutual UFO Network. Winslett recently spent about 20 hours organizing the sighting reports in MUFON’s global database from 2001-2009 — 14,362 in all. And she started noticing some trends, despite major holes in the data. With the exception of dramatic dips in 2003-05, UFO reports increased steadily throughout the decade. It should also be noted that the MUFON reports do not include most of the Canadian cases. Out of the 8,500 Canadian UFO reports filed during the past 20 years, for example, only four per cent were reported to MUFON. What would the MUFON stats be like, I wonder, if these were included? It's also interesting that Winslett had about 14,000 cases from 2001 to 2009. The Canadian database alone, for the same time period, had about 6,000 cases. Since the MUFON database is international, but contains mostly American data, it is significant that Canada has nearly half of all UFO cases in the world, at least according to these numbers. But this makes sense if we realize, as noted above, most Canadian cases never make it into MUFON files. Part of the reason for this, of course, is that there are so few MUFON investigators in Canada, and MUFON has a negligible public presence in the country. But Winslett makes another point that is most significant in the context of UFO report data. She found that about 45% of the MUFON reports were listed as "unknowns," and noted that (as we have found for Canadian UFO data) the percentage should really be around one percent. I've found the percentage actually varies year to year but hovers between three and five percent most years. I've also been taken to task by those who insist that the percentage of unknowns should be much higher - possibly around 25%. Otherwise, we'd be agreeing with Blue Book and Grudge UFO statistics, and everybody knows they can't be right! Why the oversupply of "unknowns?" As Winslett said to Cox, people submitting the MUFON UFO report forms have "multiple skill levels." That means, essentially, that most people are calling their cases "unexplained" when there are actually explanations. Surprised? Not me. It's an issue that I've been struggling with each year when I do the annual Canadian survey. As I stated in a recent book, UFO case investigation is a lost art. UFO reports are posted to websites and labeled "mysterious" even when there's not enough information to make the claim, and in cases when there is enough information, the evidence points to a simple explanation. The problem is that most UFO reports are not investigated. At all. I don't count a single email exchange between a witness in Florida and a website manager in California as "investigation." In the "good old days" of ufology, the half-dozen major UFO groups each had scores of ardent UFO investigators at the ready, fired up by bi-weekly meetings, field trips and frequent newsletters. Now, a UFO witness/buff simply posts an unsteady video of a light bouncing in a black sky to Youtube, sends a note to a UFO website and it's breathlessly described as a "beamship" on dozens of blogs worldwide. No investigation needed. Anonymity is "respected," mostly because no one bothers to check into the poster or his report at all. This is investigation? So, another statistical study of UFO reports shows there is a real phenomenon worth studying, but the data needs some serious examination. Hear, hear! Did a UFO crash in Clan Lake? 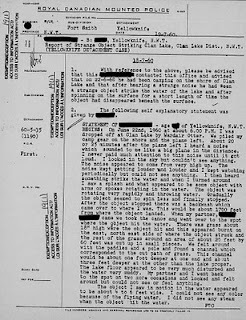 It’s been 50 years since the RCMP investigated a report that something unusual fell into Clan Lake, 30 miles north of Yellowknife. Documents have been made available on the website of the National Archives of Canada that show the RCMP and RCAF were both curious about what happened on June 22, 1960. Witness testimony described an object that apparently fell from the sky just offshore. When it reached the water, it looked like a rotating object with “arms or spokes” splashing water in all directions. When the area was investigated, a narrow channel had been formed in the reeds, but nothing was found underwater when probed with long pieces of wood. National Defence said there had not been any space object tracked in the area and therefore it was not a piece of rocket or satellite. A scientist with the National Research Council of Canada believed the object was a meteorite that was very hot from entering the atmosphere and thus sent up a cloud of steam when it hit the lake. It was suggested that this steam would have been misinterpreted as an object with spokes and water being throw off. The witness’ testimony contradicts this explanation, however. Here's the thing: meteorites are not always hot when they reach the ground. Furthermore, any meteorite large enough to cause such a big splash and create a channel in the lake bed would certainly have been of interest to the meteoriticists in the National Research Council. Yet the follow-up to the case just fizzled out. So, 50 years later, the question remains: what fell into Clan Lake in 1960? There have been a few UFO sightings in Canada so far in 2010. The most recent was a report from Prince Edward Island on January 10 that was posted to MUFON. The time on it seems to be incorrect, as the witness describes being "outside in my backyard" on a "clear night." However the time given is 18:20 GMT, which doesn't make much sense. I think he meant local time, not GMT. Anyway, he saw a "dimly visible star-like object which was moving slowly" from the SE to the S, about 45 degrees in altitude, but very high, like a satellite. It seemed to change course back to the SE and to the S a few times, but was out of sight after a total of about 10 seconds. Another sighting, this time of "two orangish lines" seen in Hamilton, ON, on January 9, was noted on a Vike site. In other news, I'm working on another book (my ninth, for gosh sake!) with a publisher's deadline in March. Topic: UFOs (of course). I have two speaking gigs coming up: one at the Scandinavian Centre (go figure) and one at Aqua Books. I just did Dee Andrew's Eye2thesky radio show on Saturday night, for a solid two hours. I didn't think I could talk for two hours on anything. Sure enough, 2009 UFO report numbers were about a quarter of that from the year before. In fact, 2007 and 2008 were significantly higher than the yearly norm, which makes the 10 or so cases in 2009 seem fewer than what you think they might be. As of August 2009, there were only 5 UFO reports in France, compared with 44 in all of 2008 and 40 in 2007, but only 7 in 2006 and 13 in 2005. If anything, the surge in 2008 for both Canada and France might be fuel for those who would link UFO report numbers with the stock market. It's been proposed before that UFO reports are inversely related to the economy. Stock market rises, UFO report numbers go down. Stock market plummets, UFO report numbers skyrocket. Trouble is, the yearly fluctuations don't seem to work if you go back a decade or two. Maybe there are additional factors, but so far it's just an interesting coincidence. Yes, it's true. Despite many premature exclamations by some UFO buffs who heralded a surge in UFO reports for 2009, when the numbers were actually tallied, UFO reports in Canada are down. Way down. First of all, the arm-waving. Why are reports down? It might be, as some have suggested, that Brian Vike "retired' from ufology mid-way through last year. Hence, it was reasoned, people may not have known where to report their sightings. Trouble is, Vike is still around. His various blogs (five or six of them) have continued to function, and he even has some cases from 2010 already posted. It's true that Vike's posts constituted a significant fraction of total Canadian cases each year, although they also reduced the percentage of Unknowns in our annual studies. Also, there are many, many more sites where people can post UFO reports. The number of videos of UFOs posted has risen dramatically during the past year. Most of the ones I've seen are noting more than planes or birds. A few are curious, like some of the Niagara Falls footage that is currently being investigated by some researchers from the USA. The reduction in the number of Canadian UFO cases in 2009 flies in the face of other claims, such as that by the British Ministry of Defence that report numbers were way up in 2009 (e.g. http://bit.ly/XMMNI). That may be so, but since UFO report numbers are cyclic, it could be that Britain was just catching up to Canada. So, in Canada in 2009, there were 596 UFO reports filed at various websites, groups and agencies, including government and military organizations. This compares with 1004 reports in 2008, a 41% decrease in numbers. This also puts the number of UFO reports for Canada at about a level just behind 2003 report numbers, giving 2009 a ranking of the seventh-highest number of UFO reports on record. Not bad, but the 40% reduction is obviously significant. The 2009 value may change a bit as additional reports trickle in, but we can say with certainty that 2009 was not the Year of UFOs in Canada. Were aliens scared away from Earth because of political change? increased worldwide war campaigns? the impending arrival of Google Nexus? Was it something specifically Canadian that caused a countrywide reduction in UFO report numbers? the lousy summer that Canada had last year? the downturn in home sales in Alberta? cost overruns at the 2010 Olympics?